Since locating its right guard in Deonte Brown during the middle portion of the season, Alabama’s offensive line has been steady. 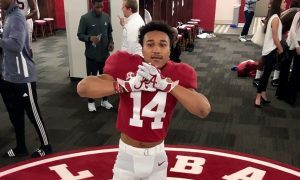 Under coach Brent Key, this is a group that has assisted Tua Tagovailoa, Damien Harris and Jerry Jeudy among others in making the offense stand out more so than the Crimson Tide’s defense through 13 games. 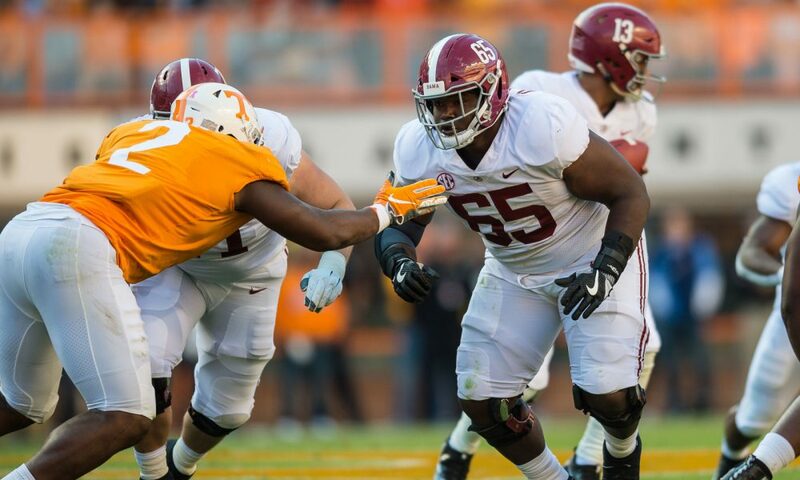 With veterans like Ross Pierschbacher and Jonah Williams leading the group, Alabama’s front line was named one of three finalists for the Joe Moore Award. 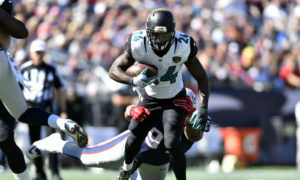 An announcement came Tuesday morning from the Foundation of Teamwork, which is a nonprofit organization dedicated to fostering the essential aspect of all great societal endeavors. 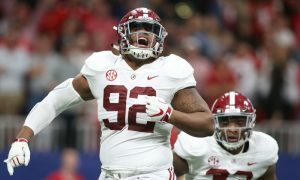 The groups for University of Georgia and University of Oklahoma join the Tide as the other two finalists for the honor, which goes to college football’s best offensive line unit. For the Crimson Tide, its front line has cleared the way for an average of 47.9 points and 528 yards offensively per matchup. Head coach Nick Saban has witnessed his unit record at least 50 points in eight games – including a pair of 60 points contests versus Mississippi and Arkansas. Tagovailoa, a sophomore, has been the greatest beneficiary of this group as he accounts for 3,353 passing yards with 37 touchdowns passes to four interceptions at quarterback. 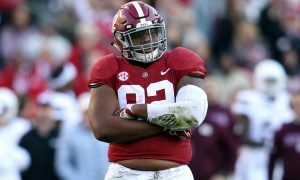 Alabama’s offensive line guided him to five 300-yard passing performances and four games where he’s tossed for four scores. 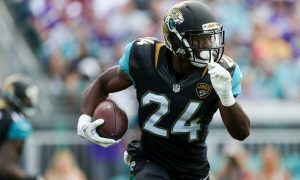 His output in passing yards is second all-time for a single-season behind former Tide signal-caller, Blake Sims, who collected 3,487 yards in his senior year in 2014. Tagovailoa has tallied 42 total scores as a first-year starter, setting a new school record in that department for a season and has 48 career touchdown passes (tied for second all-time in UA history with Jalen Hurts and John Parker Wilson). While he is a finalist for the Heisman Memorial Trophy, the trench guys for the Tide have also managed to pace a balanced attack. Damien Harris and Najee Harris each have at least 600 yards rushing, with the elder Harris leading the duo at 771 yards. The senior from Kentucky is now 229 yards shy of becoming the first running back in school history to collect three consecutive 1,000-yard seasons. 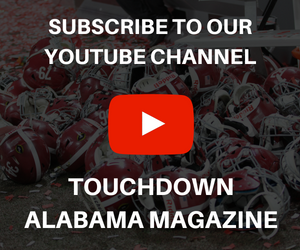 Josh Jacobs, a junior, leads the team in rushing touchdowns (11) and won Most Valuable Player honors for his efforts in the Southeastern Conference title game. 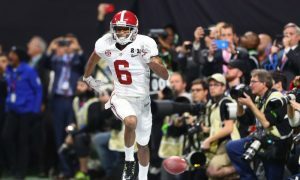 He posted 83 yards rushing with one touchdown on eight carries versus Georgia, aiding the Tide to a 35-28 comeback victory. 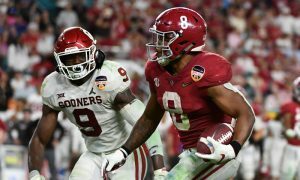 It is fitting to have two of the three finalists for the Joe Moore Award face each other in one of the College Football Playoff semifinal games. As Oklahoma battles Alabama at Hard Rock Stadium on Saturday, Dec. 29 in Miami, Fla., it will be interesting to see which defense cracks first.